This is the first of three posts on my personal experience of mandatory retirement in Ireland. Irish Labour TD (Member of Parliament) Anne Ferris has tabled a Bill to abolish mandatory retirement age. The Employment Equality (Abolition of Mandatory Retirement Age) Bill would prohibit employers imposing compulsory retirement ages on their employees. In November last, as a member of Age Action, I was asked to take part in their presentation at the Public Hearings of the Committee stage of the Bill at Leinster House,the seat of our Parliament, the Oireachtas, in Dublin. This was my first visit to the Oireachtas and it was appropriate that I was there on a mission about a matter very dear to my heart. I had to vacate my job on my 65th birthday. At age 64 and 364 days I was an acceptable employee, but one day later I was unemployable. My ‘shelf life’ was up; my ‘use by’ date had been reached. Indeed I was fully aware for a long time that my career would grind to a halt at age 65, but I had hoped against hope that new provisions whereby public sector employees who joined after 2004 would not have to retire at age 65, could be extended to serving staff members.This was not to be and my pleas fell on deaf ears. The mandatory retirement age of 65 in the public sector department in which I worked was written in stone, and so agreed with the trade unions. In some departments the mandatory retirement age is 60. It was a privilege to be able to add my voice at the Public Hearings of the Committee stage of the proposed legislation at Leinster House and to hear the heartfelt submissions being made by other participants. Some fearful of losing their jobs at compulsory retirement age because of ongoing family commitments, such as children at university for example, mortgage to pay. Others simply wanted to be able to stay and continue doing a good job as they had done for some time, some angry at having to lose their jobs at a particular age, yet not qualifying for state pension for some years afterwards or despairing of a system that allows for the casting aside of a wealth of experience as with doctors and nurses in our health service, just because of an accidental birthday. Below are links to the official tapes of the Public Hearings at Leinster House. The recording begins at about 34 minutes in, with Age Action opening statement at 36.50 and my (very wobbly) contribution at 39 minutes mark. .
Donegal Woman Claims Age Discrimination At Being Forced To Retire From Job, NWT, Thurs, 19th Nov . I am unsure about how long the link will remain live. Other interviews were aired on the Pat Kenny Show on Newstalk and on Highland Radio while the Irish Daily Mail carried articles on two separate days. Just before Christmas the Final Report to Government was published and can be seen here. The Report recommends a change to the existing law and we look forward to a time when this will become a reality. I would like to express my thanks to Justin Moran and all the Age Action team who do such wonderful work in raising awareness of issues that directly affect the quality of life of older people in Ireland. International Women’s Day – Make it Happen with Kiva! International Women’s Day 2015 is on Sunday March 8th, with a theme this year of ‘Make it Happen’! Unable to attend any of the very many events happening across the world, I wondered how I as an individual might ‘Make it Happen’. No sooner had I begun wondering than an email arrived, announcing that I had received a repayment on a loan I had made through Kiva. That’s it, I thought! By donating the money I saved through not attending a real live event, I can ‘Make it Happen’ for women less fortunate than myself. Kiva is a microfunding, not for profit organization that facilitates loans to low-income entrepreneurs and students, male and female, in over 70 countries. It is possible for those of us with limited means to make a difference as the smallest loan amount is 25 USD . Kiva Zip,a sister organization granting interest-free loans to people in USA and Kenya, accepts loans from as little as $5. Ordinarily you will be repaid- it is such a thrill to get an email saying ‘You have received a repayment of 19 cents!’ When your loan is repaid, you can claim back the money or relend it again to another person or project. So for International Women’s Day, I have decided to focus my loans on women in underdeveloped countries, to ‘Make it Happen’ for them. Traditionally these women who have incomes, however small, are empowered to change their lives and educate their children, thereby benefiting their entire communities. Down the decades, the movement has continued to grow and has become a worldwide event, celebrating social, political and economic changes for women, highlighting inequalities and raising money for charity. In 25 countries it is an official holiday while in China Madagascar and Nepal it is an official holiday for women only. In many countries from Bangladesh to Guinea, from Vietnam to Iceland, from Afghanistan to Zambia, events will take place on March 8th to mark International Women’s Day. The top 5 countries for International Women’s day activity to mark the centenary on March 8th are the UK, Canada, Australia, the United States and Ireland. Details of events across the globe can be found on the International Women’s Day site here. What better day to log in to Kiva and make a small loan to help our sisters across the globe! I was delighted to receive an invitation for myself and a guest to the award ceremony for the Google Silver Surfer Awards with Age Action, which took place in Dublin on Wednesday last. I was thrilled to be back in Google, with Louise, for the first time since I won the Social Networking Award in 2011, and to meet again with the stalwarts of Age Action – Robin Webster, Eamon Timmins and Pauline Power. Google epitomizes everything that is young, innovative and fun. This is clear from the moment you step through the front door! All the more wonderful then that they sponsor the annual Silver Surfer Awards that celebrate older people and technology. A perfect marriage in many ways. The ceremony took place in the spacious and comfortable state of the art Google auditorium. We were entertained by the talented Bugle Babes with their Andrews Sisters type repertoire and harmonies, and their (perfectly straight) seamed stockings (George Hook checked them out).Their singing was beautiful and well enjoyed by everyone! The ever young George Hook, broadcaster, journalist and rugby pundit hosted the ceremony with great wit and humour, and Mr Pat Rabbitte, Minister for Communications, Energy and Natural Resources attended – both of whom are, appropriately enough, Seniors. Minister Rabbitte expressed the wish that no senior citizen be left behind in this era of instant communication. Sinead Gibney, Social Action Manager with Google, and Robin Webster, the indefatigable Chief Executive of Age Action were also present. Sinead treated us to a reading of the poem ‘When I am old’, which can be seen on my blog page here . Pauline Power who operates the Getting Started Programme with Age Action and Anne Marie Walsh, the Event Manager, ensured that things flowed smoothly. Austin was the winner of this category. His story is inspirational – having left school early he had some catching up to do in later life and this he did using technology. He has written a biography for his family. I was particularly interested in this category as my ears pricked up when I heard the name Seamus Harkin from Creeslough. Creeslough is 7 mile s from my home village of Carrigart, Co Donegal. On an all-too-rare visit back to my roots this summer, we were in search of the site of a former 19th Century Revenue Barracks in Creeslough. We were given Seamus Harkin’s phone number. Seamus Harkin is all things Creeslough and is a highly respected fountain of all sorts of historical knowledge in this particular area He was most helpful and accommodating. We spoke several times by phone, but I had not met him until today, so that was a particularly pleasant meeting! Thanks again Seamus for sharing your knowledge and time with us. Seamus is known as the Singing Undertaker at home and he fixes fiddles as a hobby- how interesting is that! Well done on this achievement Seamus agus Tír Chonaill Abú! An individual or group of any age who provides voluntary support to older learners. Anne won this award for her work in upskilling some 40 tutors. Anne is from Louth and were other nominees – Drogheda & District Support 4 Older People. Small county with big hearts for older people! I love the Golden category – here are people of advanced years who have engaged with what can be a challenging medium – perhaps they came to it after losing a life partner – and here they have found a new way of doing things, new ways to keep in touch, and have enhanced their lives. Michael was the winner this year. He has long been an advocate of technology and encourages older people especially to use it . Michael has a blog The Commonplace Book that is worth a visit for the quotes alone! The judges for all of these categories had a challenging task to pick just one from each of these categories as they are heroes all! An older person who embraces the Internet or technology with a sense of fun and adventure. The winner of this over arching award was David, who has become something of a techie since his retirement and has indulged his passions for music and digital photography, and entertains his grandchildren with his technical expertise! With Apologies to Maura and Fred for the blurred photographs. Michael in this category was an inspiration to all of us – he suffered a stroke but then used his experience to help others and technology is a perfect medium for him. Well done to you all! This is an appropriate place to give a huge shout out for Age Action Ireland This is a n Irish Charity that promotes positive ageing and better policies and services for older people. Age Action is regularly in the news headlines speaking out about issues that affect all of us who are older and more vulnerable. Ageing is an issue that hopefully will affect all of us of every age. Do drop in to their webpage here to see the wonderful work that they do, – work that enhances the lives of thousands of people and of society as a whole. At a delicious and beautifully presented lunch afterwards ,entertainment was provided by the excellent and splendidly named barbershop quartet, the Sea Sharps . It was a great event and hearty congratulations again to all the finalists – winners all! As we left the premises,I couldn’t resist taking a shot of the decoration in the washrooms. The very colourful landing with floor, walls and ceiling covered with faces – after all that is what Google is all about – people of ALL ages! Thank you Google, and thank you Age Action! Stone of Hope Memorial to Martin Luther King, Washington D.C. 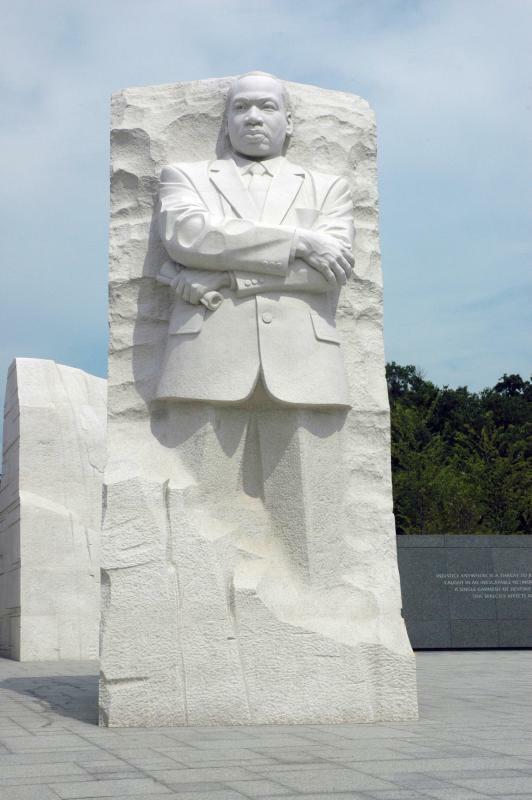 It has been revealed in a book, Behind the Dream, by Clarence Jones, a close associate of King, that when he was delivering the speech a singer who had performed earlier in the programme called out ‘tell them about the dream Martin, tell them about the dream.’ King put his speech to one side and so the ‘I have a dream’ part of this speech was not scripted, but was delivered spontaneously and from the heart with raw emotion. Martin Luther King was assassinated in Memphis, Tennessee on this day 45 years ago, April 4, 1968. He was 39 years old. His messages of justice and equality, his rhetoric and his inspiration live on, resonating across the decades. 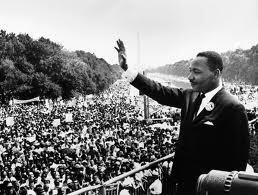 He delivered many memorable speeches, but it is ‘I have a Dream‘ that made him a household name across the world. This is the full text of ‘I have a Dream‘ delivered at the march on Washington, DC, August 28, 1963. 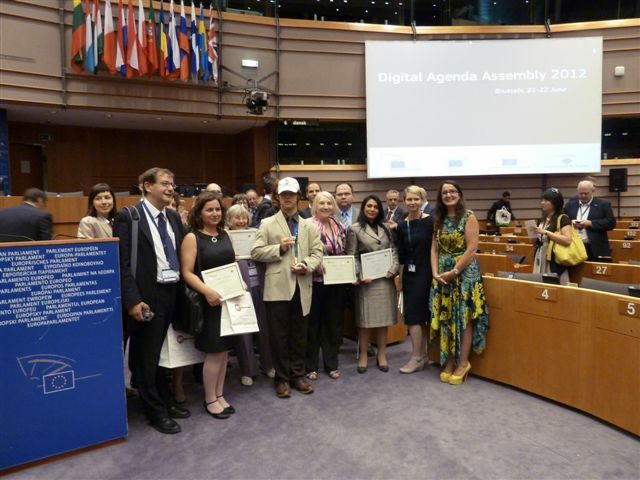 Attended by 1,150 people, followed through internet live-streaming by another 4,000 and, with more than 1,000 social media contributions, I was honoured, thrilled and humbled to be part of the Digital Agenda Assembly in Brussels on 21 and 22 June 2012. The e-Inclusion Awards were established by the European Commission in 2008 ‘to discover and celebrate organizations and individuals across Europe who champion new technology and harness the potential of the internet as a means of improving prospects, increasing employability and meeting today’s complex social and economic challenges‘. As one of only three finalists from across Europe in the category ‘ I am Part of IT ‘ Personal Stories’ -(Larger Organizations) ‘ I was nominated by Age Action Ireland as a result of winning the Google /Age Action Silver Surfer Award, Social Networking category in 2011 . Age Action is an Irish national charity which promotes positive ageing and better policies and services for older people. It actively encourages older people ( age 55+ ) to embrace social media. Their ‘Getting Started’ programme, spearheaded by the inspirational Pauline Power, promotes active e-inclusion and has been rolled out to over 6,000 people in the past four years. Nominated as a finalist from entries from 34 countries, Pauline accompanied me to the Digital Media Agenda conference in the European Parliament in Brussels. Day 1 was devoted to workshops, and our invitation was specifically for the Social Media workshop and feedback sessions, with day 2 seeing the plenary sessions in the European Parliament chamber itself. Here we were honoured to be among delegates to greet Neelie Kroes, Vice President of the European Commission responsible for the Digital Agenda for Europe, after her very eloquent address to the assembly. Among the academics, industrialists, politicians and social groups participating were Professor Luciano Floridi from University of Hertfordshire and University of Oxford, Harry van Dorenmalen chairman of IBM Europe, Gyula Vamosi leader of the Roma (Gypsy) community ; Anna Maria Darmanin , Vice President European Economic and Social Committee. Whilst the conference focused on the ‘big picture’ with regard to the information society and the breaking down of barriers to e- inclusion for all citizens of Europe, it is the ways in which ordinary people access and use the internet that demonstrates just how well the high level goals are making a difference to everyday lives. 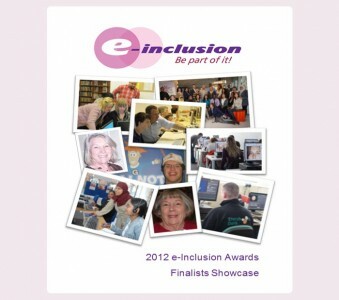 Anna Maria Darmanin from Malta presented the e-inclusion awards in the four categories. I am part of IT – Personal stories, small organizations (< 19 employees). Joy Matthews from Caerphilly, Wales and the 50+ Positive Action Partnership. Elton Kalica , Italy . Elton was a most worthy and inspirational winner of this category . Arriving in Italy from Albania he found himself in prison for a long time. Through ICT skills he improved his capabilities, did two university degrees and now, having been released he has a good job on the ‘outside’; helping prisoners. Marek Sikora, Chezh Republic. Marek was the first visually impaired ECDL tester in the Czech republic and he set up a not for profit organization Eye-T.cz to enable visiually impaired people take ICT skills tests. Myself, Angela Gallagher, Republic of Ireland with Age Action , who in spite of living in a rural location without the benefit of broadband has embraced social media. My experience of how technology can change a person’s life will hopefully inspire more older people to take the plunge and learn how to use computers and the internet. Siemon Dekelver from Belgium had a story about ability, not disability. He was a most inspirational and worthy winner of this category, with WAI-NOT which provides mentally challenged young people with secure web-based communication tools so they can learn IT skills and lead happy and independent socially interactive lives. Be part of IT – small organizations . Storybook Dads – UK were worthy winners – the simple yet ingenious way to use the internet to improve the lives of families of a parent in prison was truly moving. Imprisoned parents record stories for children to be involved in their lives. The initiative has been shown to cut reoffending. Be part of IT – big organizations. UK Online Centres which help communities deal with social and digital exclusion . A network of 3,800 online communities spreads the word on digital inclusion. The Information Society Development Foundation Poland – local libraries as agents for digital change. Thousands of librarians in thousands of remote communities have been trained to help otherwise excluded communities become e-included. The judges felt that both the Barcelona Activa and Information Society Development Foundation from Poland were such extraordinary projects that touched the lives of so many, both were declared winners. Anna Maria Darmanin, Vice President European Economic & Social Committee (on extreme right) with finalists in the e-inclusion awards. Each finalist had a wonderful story to tell. Each story was thoroughly inspirational, and each story was a tribute to the perseverance and dedication of ordinary people who through personal efforts and dedication, made their own lives and the lives of others, extraordinary. I am grateful to Age Action Ireland for nominating me and especially to Pauline Power who was with me in Brussels; to my son Damian, author of his own excellent blog http://irishamericancivilwar.com/ for encouraging me to get started and for his support in setting up this blog, and to the over 20,000 visitors to this site. Thank you all!